If you have purchase Kashi products in the past few years, don’t miss this! For anyone that purchased qualifying products between 5/3/08 and 9/4/15 (and you don’t have a receipt anymore), you can qualify for a check up to $27.50. If you happen to have proof of your purchases, there is no limit to your monetary compensation!! 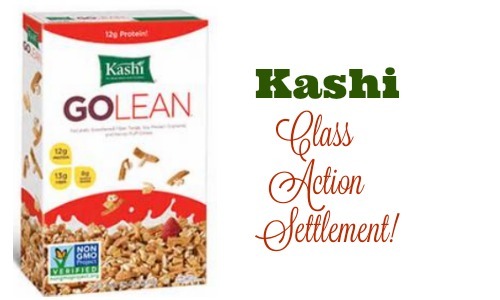 This is part of a Kashi Class Action Settlement. You must not be a California resident and must have purchased for personal or household use. You can find a few list of products here and more information about the settlement too. To submit your claim, complete the form no later than January 19th, 2016. You can also print the claim form and mail it to Digital Settlement Group, LLC, P.O. Box 1571, West Palm Beach, FL 33402. You still have time to submit for the Starkist Class Action Settlement too!